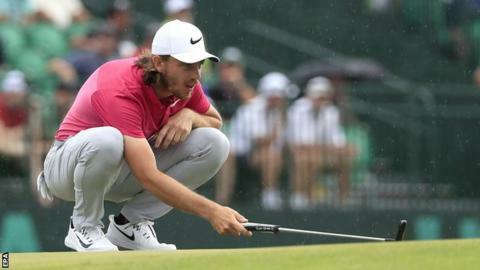 Tommy Fleetwood has been backed to win the US Open by coach Norman Marshall, who first taught him as a six-year-old. England's Fleetwood, who has never won a major, is one shot off the lead going into the final round on Sunday. "Knowing Tommy as I know him and seeing what he has done in the past, every time he has got within a sniff of winning a big tournament, he's gone for it 100%," said Marshall. "There's no backing down in Tommy and that's what the exciting thing is." Southport's Fleetwood, 26, won the Abu Dhabi Championship to claim his second European Tour title earlier this year. "Give him a chance on that back nine and I know he will go for it," added Marshall, who was speaking on BBC Radio 5 live's Sportsweek programme. "I think he is going to do it. There is something different about him. Winners are cut from a different cloth and he is." Marshall said he became aware very soon of how talented Fleetwood was after measuring him in some of the drills he used. "We had a vinyl target which laid on the floor - it looked like an archery target - and me and the other golf pros were always competing against each other," he said. "It made a noise when a ball landed on it. We used to hit 25 balls - three metres by three metres the target was - and my best ever was 14 and when Tommy was eight he hit it with 21 out of 25 balls. "It was at that point that I realised he was totally different."